Every month, I write, develop and test 21 seasonal recipes for LandScape magazine, a countryside-themed magazine with articles on food and food production, crafting and gardening, as its home economist. Featuring in the January issue, this marmalade and ginger cake was a triumph when I tested it, with lots of my guinea pigs coming back for more. 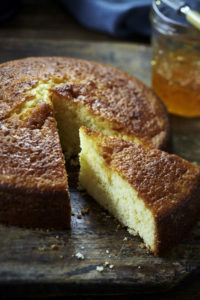 A January tonic, the cake packs some punch with bitter and full flavours dominating and is great with a dollop of sour cream. You can easily make this vegan by replacing the butter with the same amount of rapeseed oil and the egg with 60ml of chickpea brine from a tin of chickpeas, and then serve it with a thick coconut yogurt (my favourite is CoYo). And it is the season to get making that marmalade yourself with Seville oranges – give it a go; it makes the cake all that more fresh.